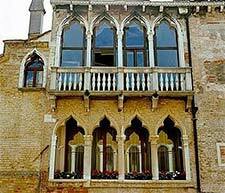 The three-star Hotel Pausania occupies a 14th Century Venetian Gothic palazzo near two of our favorite squares in Venice, the Campo Santa Margherita and the Campo San Barnaba (which you may have seen in the movie Summertime or Indiana Jones and the Last Crusade). It's easy to reach, without crossing any bridges, from the Ca' Rezzonico stop on the Alilaguna airport boat's Linea Arancio. As you leave the boat platform, walk straight down the Calle del Traghetto to the Campo San Barnaba. At the Campo San Barnaba, bear right toward the water. Continue along the canal on the Fondamenta Gherardini, past the bridge and the vegetable barge. The Hotel Pausania will be on your left, before the next bridge. Leave the San Basilio cruise terminal by the main doors and walk straight ahead to the wooden bridge. Cross the bridge and walk a short distance to the San Basilio vaporetto (water bus) stop. Just across from the vaporetto stop, you'll see a narrow pedestrian street with a restaurant to the left of the Billa supermarket. Go down the street, which is named the Calle del Vento. In about half a minute, you'll reach a small square with a bridge (the Campo San Basegio). Do not cross the bridge--instead, continue inland along the canal until you reach the Calle dell'Avogaria, which goes off to the right from another bridge. Turn right on the Calle dell'Avogaria and cross the next bridge into the Calle Lunga San Barnaba. At the first corner, turn left and walk a short distance to the Fondamenta Gherardini, a street that runs along the San Barnaba Canal. Turn right. The Hotel Pausania will be just down the street, facing the canal.